Olympus 2GB XD Card Type M Compact and durable, the Olympus xD-Picture Card is the ultimate reusable, removable digital media. Besides providing a large amount of storage capacity for your high-resolution images, they also offer compatibility with most manufacturers' xD-compatible devices. 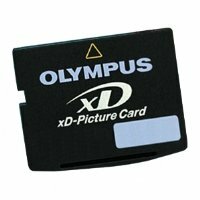 Olympus xD-Picture Cards are the only xD Cards to support the Panorama function found with today's Olympus digital cameras. Type M xD-Picture Cards keep your digital data safe, so you can shoot or share your pictures and movies at any time. Their compact size means you can take them anywhere — and because they're compatible with a variety of media reader/writers, you can download your files in no time flat.